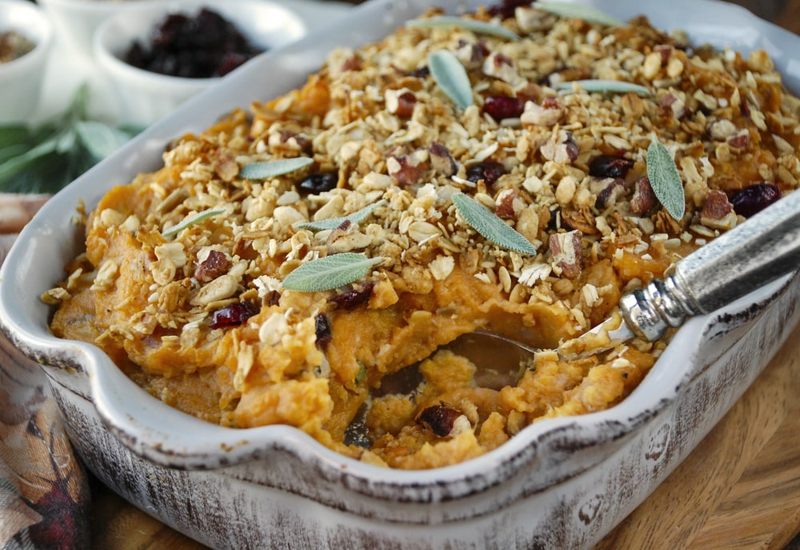 This version of a sweet potato casserole is lightened with the addition of cauliflower. Maple syrup and sage add distinctive sweet and savory notes. Chopped pecans and dried cranberries add additional texture and seasonal flavor to the dish. 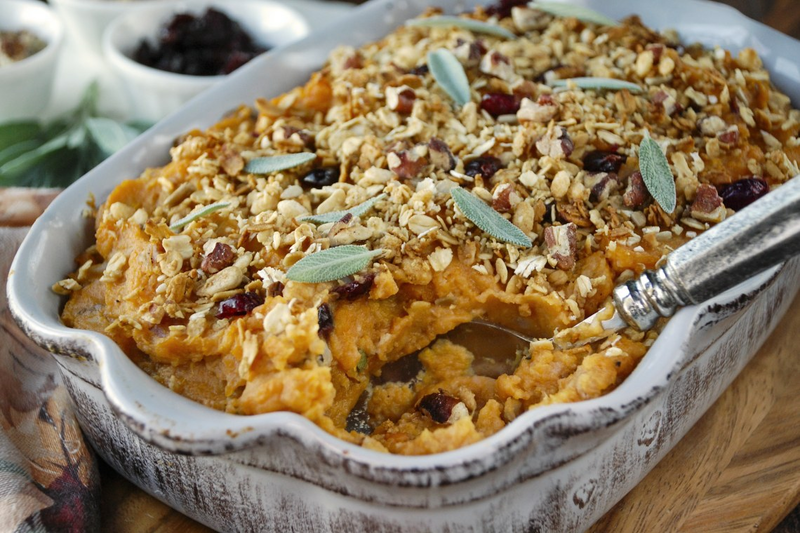 This rich, creamy baked dish is then topped with granola for a fun and flavorful crunch. Be careful because once you bring this to the Thanksgiving table, your friends and family will be begging for you to make it every year! This can be assembled the night before serving. Just bring the dish to room temperature and bake covered for 15 minutes before removing cover and continuing to bake as directed. Per Serving: 332 calories; 12g fat; 53.5g carbohydrates; 6g protein; 13mg cholesterol; 361mg sodium. In the process of my Thanksgiving prep, my wife and I decided to make this recipe. It was very creamy and surprisingly delicious. The maple syrup was a great touch. This will definitely be on this year's menu. I really loved the cranberries, pecans, and granola in this dish. 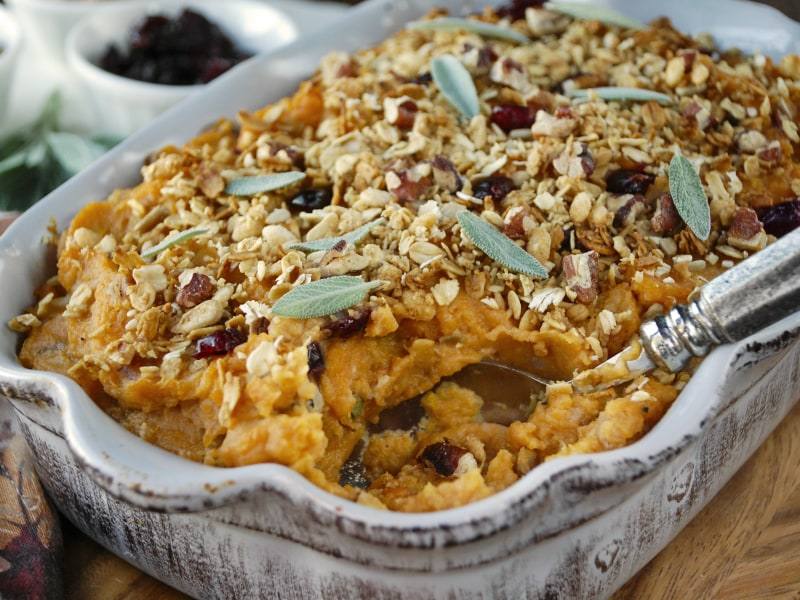 It reminds me of the sweet potatoes my grandmother used to make for the holidays! So sweet and yummy!